Bhindi Masala recipe by Flahet at DesiRecipes.com. 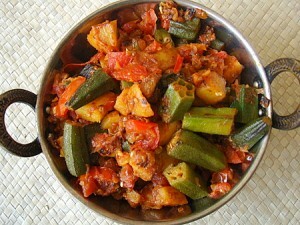 Bhindi or Okra is a delicious main course vegetable dish filled with spices. Add okra and fry on medium heat until almost done. Add little water as needed to prevent burning. Slice remaining 2 onion and sprinkle on top of okra . Cut one tomato into cubes and sprinkle on top followed by cilantro chopped cover and simmer until okra is done. Then remove from heat and serve. You may squeeze some lemon juice on before serving for some extra zing...also you may add chopped green chilles before simmering if you like.